The players. I happen to think that having good cheese is important for this. Tillamook, anyone? Also, I tried applewood smoked bacon for the first time when I made this and I’m hooked. Sautee Bacon, Onion and Garlic together in butter until bacon is starting to brown (but not crispy) and onions are clear. Set aside. Add potatoes, butter and salt to a bowl and mix well. 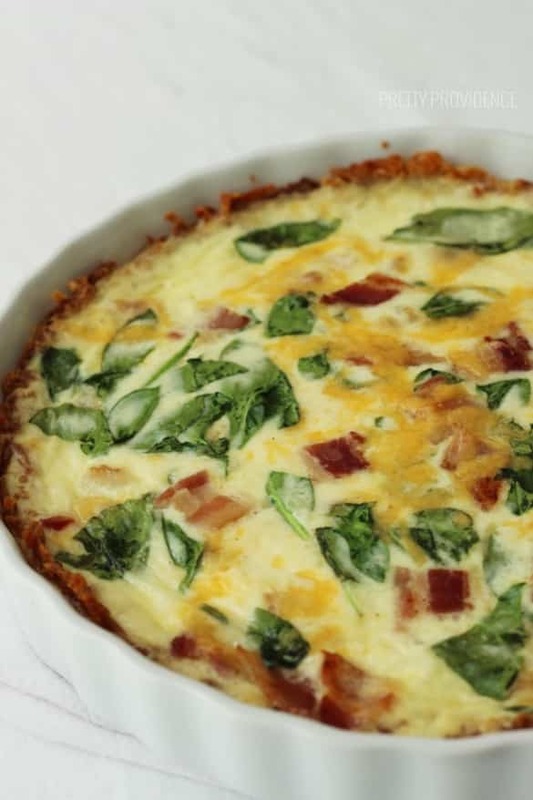 Pour potato mixture into the quiche dish and press across the bottom and sides with your hands or a spatula. Spray the mixture with oil spray. Bake for 30 minutes. Add eggs, milk, cream, salt, and cinnamon to a bowl. Whisk until well mixed. When the crust is baked, switch the oven to 350 degrees. Cover the crust layer with bacon, onion and garlic mixture. 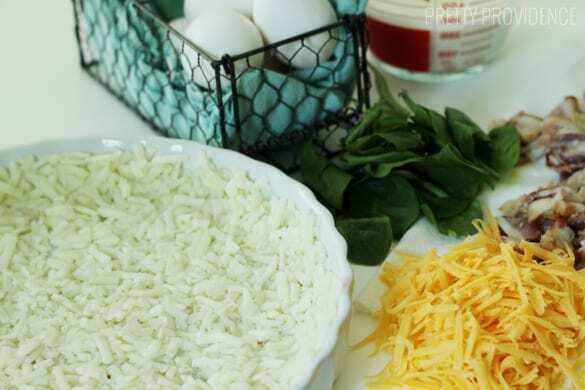 Next, sprinkle a layer of cheese. Throw in a handful of spinach. Pour egg mixture over all of that and bake for 25 minutes or until cooked through. See? Pretty easy! 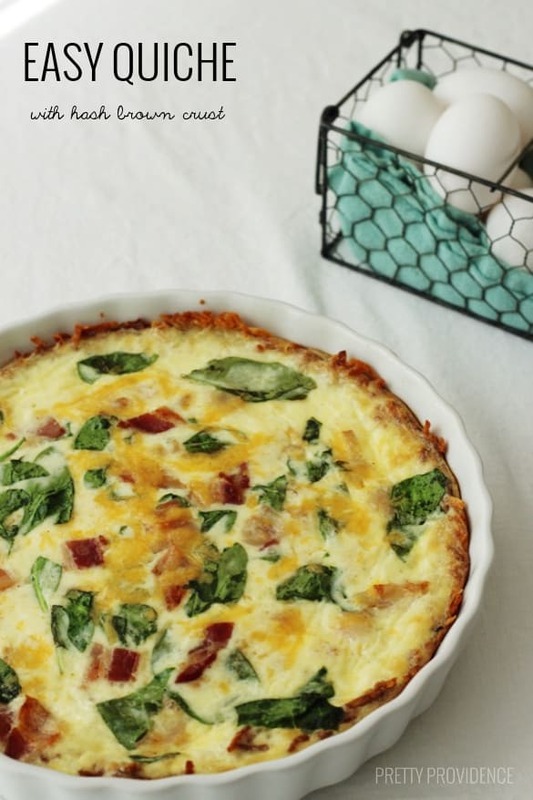 I really think this is going to be your new favorite breakfast or brunch recipe. I know it’s mine. 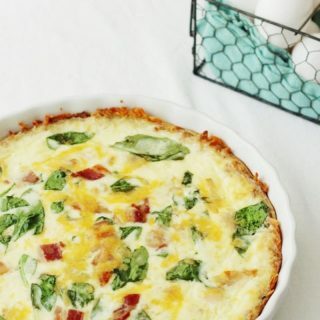 So… breakfast for dinner tonight? If you like this you’ll probably love the World’s Best Breakfast Casserole and German Pancakes, too! 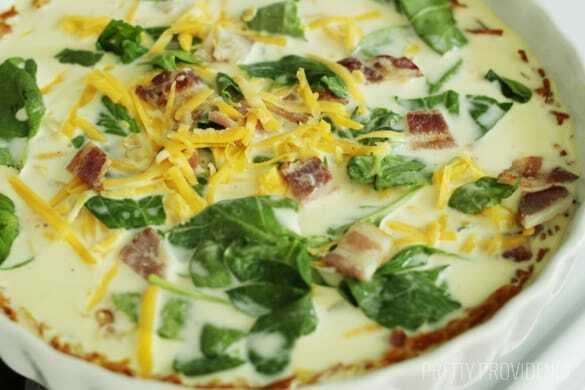 Check out a sneak peak video to see how easy the World’s Best Casserole actually is to make below! I have a question about the number of eggs, and egg yolks…if I am doubling this recipe, do I have a total of 4 eggs and an additional 4 egg yolks? This looks amazing! I might have to try making this over the weekend. I was surprised by the addition of cinnamon, but I’m willing to try it! It is a really good addition! You can barely tell it’s there but it adds a lot to the flavor. I have been making a version of this for years, it is a family favorite. We have it once a week. It is cheap, easy and quick. It can be served hot or cold which makes it great for busy nights when everyone is eating at different times. I put green onions, red peppers and ham in mine.